From the moment you walk into your one, two, or three bedroom apartment in The Woodlands, Texas, you’ll begin to unwind. 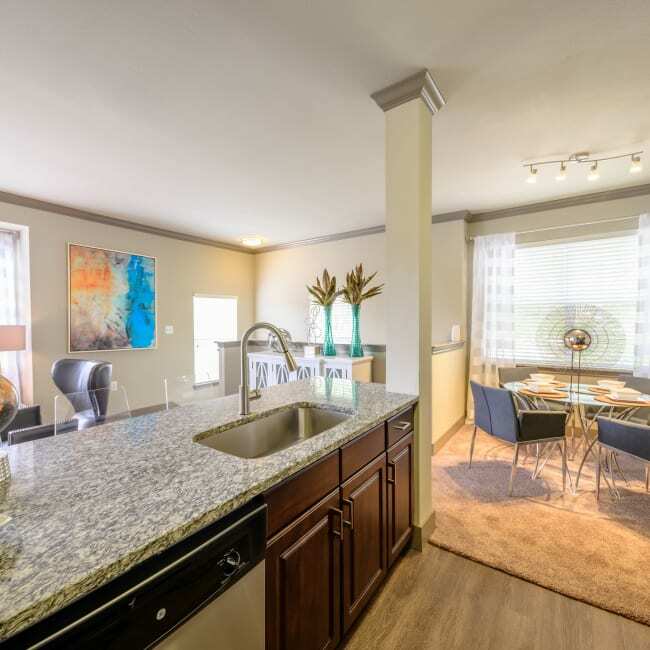 Your new apartment is packed not only with stylish details like granite countertops but practical conveniences as well. Your dishwasher and garbage disposal make cleanup fast and simple. Walk-in closets, linen closets, and built-in shelves keep possessions organized. Washer and dryer connections mean no waiting for machines or lugging hampers. And powerful air conditioning keeps you comfortable even in sweltering heat. As you stroll around the well-manicured grounds, you’ll pick up a calm, relaxing vibe. The lake views, the resort-style pool, and the sophisticated clubhouse make you feel like you’re on vacation every day. But just as important are the low-key advantages like convenient online rental payments, curbside trash pickup, and friendly, attentive staff. You won’t just like living at Artisan at Lake Wyndemere. You’ll love it. Come see what life at the lake is all about. Contact our friendly staff to arrange your personal tour.